THE SKINNY: Now that cooler weather is here, I don't mind wearing liquid foundation again for days when I need to look professional and polished. 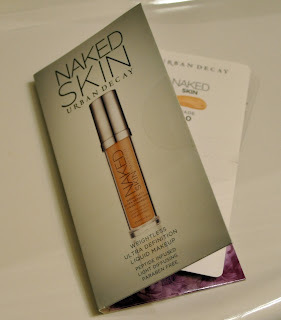 My favorite of late is Urban Decay's Naked Weightless Ultra Definition Liquid Makeup. This feels just as light as you would expect something called "weightless" to be, and it's really similar to my summer go-to product, Urban Decay's BB cream. The makeup's coverage is decent, and a little finishing powder can perk up the look halfway through the work day. Best, this foundation doesn't show on my skin. I don't look like I'm wearing much makeup, and it never appears cakey or off-color. Urban Decay's shades work on a numeric scale, raning from 0.5 to 9.0. The 2.0 works best on my fair skin. It has a hint of yellow, which helps tone down the redness cold weather can cause. This is a touch expensive, but a little bit goes a long way. A full-size bottle will last me all winter and then some. CHECK IT OUT: See all the shades available at the Urban Decay website.